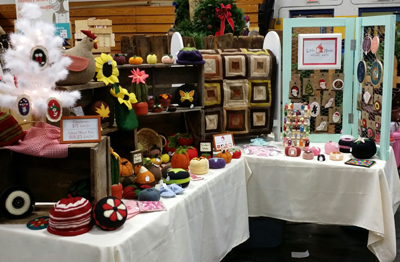 Little House Home Arts: Another Holiday Craft Sale This Saturday! 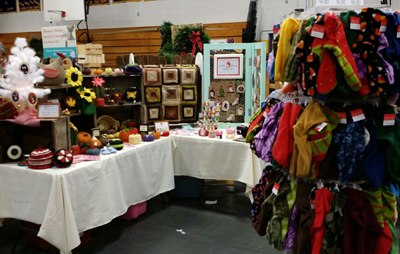 Another Holiday Craft Sale This Saturday! I wanted to let you all know that we will be at The Holiday Inn, Rt 7 South, Rutland, Vermont this next Saturday from 9:00 a.m. to 4:00 p.m. along with many other artists and craftspeople! We hope that you won't forget to stop in! Guaranteed you will be able to find unusual and unique holiday gifts for your holiday gift giving needs! This is a peek at our booth at our last two shows. 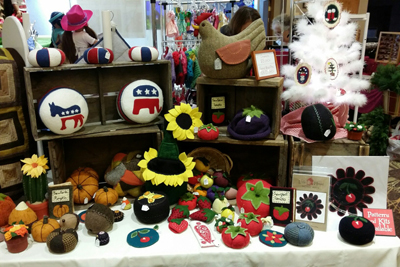 We continue to feature unusual pincushions, wool doorstop hens, wool lap robe, wool ornaments, kits for penny rugs and pincushions and hand-knit wool hats, It is also a great time to pick up fleece socks at a bargain price, guaranteed to keep your feet warm and help you accomplish "great feats"! You may also find many of these items on-line and if you don't, please ask. I would be happy to send you pictures of what isn't listed in my Etsy shop or by clicking on my fleece sock order site on the right hand side of my website!